It’s a common question, “Is My Dog Fat? One of Dr. Pat’s “pet peeves” is when people refer to dogs as “fat” without a good understanding of what defines extra weight on a dog. 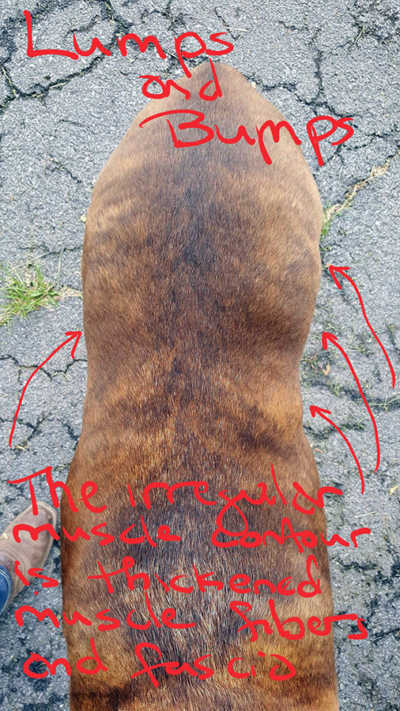 Dogs may have a thick waist line due to the thickening of lumbar muscles and tight (hypertonic) muscles causing stress, misalignment, dysfunction, and pain. When the lumbar spine is misaligned, it causes compression on the spinal joints and irritation to the soft tissue and nerves. The result? A dog’s posture and movement is altered, adding stress and strain to the hips, hind limbs, shoulders, and neck. Because these dogs are uncomfortable, they become less active and may gain excess weight. 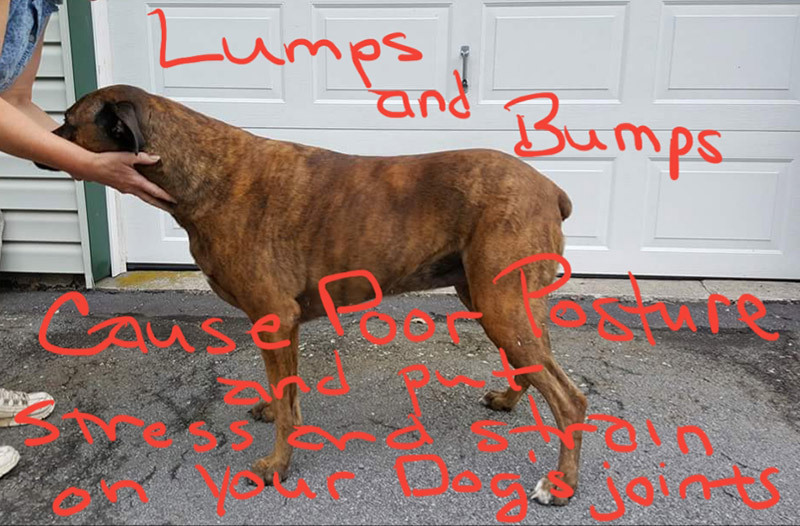 This only adds to the stress and wear on their body and overall health and the creation of a body type with “Lumps and Bumps”. And this type of thick waist can’t be reversed with a restricted diet. Trained professionals and other health practitioners can miss the myofascial thickening and lumbar strain. It is Dr. Pat’s mission to educate dog owners and professionals so they understand and address this prevalent problem in dogs young and old, large and small. Acupuncture, chiropractic, and other body work can help but one of the simplest and easiest ways for an owner or professional to help these “fat” dogs is through cross fiber massage with the Posture Prep Cross Fiber groomer. This helps to break up the adhesions and scar tissue and restore normal muscle health and symmetry, minimizing the “Lumps and Bumps”. Dogs love the attention and relief they get while bonding with their human companions. Dogs and cats come to us when they want attention or a reward and leave when they please us. Most dogs enjoy the relieving touch of the Posture Prep tool especially when you apply the cross fiber massage. Some dogs may need gentle, consistent reassurance and desensitization to the tool until they can understand how you are trying to help them. Applying the Posture Prep with patience and a healing and loving intent is the key to your success. Even the most antsy dog will understand what their human is doing for them as the Posture Prep helps to relax and release the stress on their muscles and joints. Dr. Pat is available for lectures, clinics, or demos at local or regional associations, fundraisers, and other events. Please be sure to check the calendar for upcoming and past events. By Jaclyn Amaru Does your dog enjoy a good romp around in … "New Year’s Resolution; A Guide to Healthier Dog Care This Winter"
By Jaclyn Amaru Are you looking to give the gift that keeps … "This Gift Will Make You Go “Ahhhhh”"
By Jaclyn Amaru As people are developing healthier, more active lifestyles, our … "Tips for Maintaining an Active and Healthy Dog"
Are you wanting to incorporate your furry buddy into your daily routine, … "The Ultimate Guide to Bonding With Your Dog This Summer"